Say \'Hello\' to the amazing and hilarious characters of the famous cartoon Madagascar in fresh unique coloring game from awesome DoubleGames masters! Color amazing pictures of Gloria and Marty and other animals totally for free and get pleasure! Don\'t miss Madagascar 3: Europe\'s Most Wanted, the third installment of the interesting movie created by DreamWorks Animation studio. It speaks us about brave and amazing characters who left the zoo to return home. 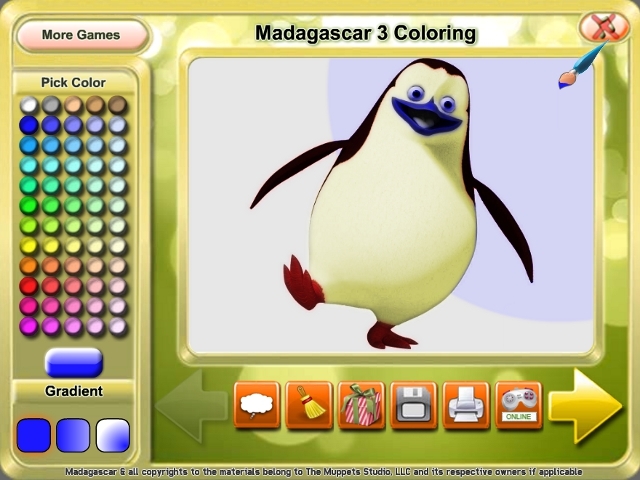 DoubleGames made their free download game Madagascar 3 Coloring based on this story! Meet Alex, Marty and others in this free coloring game! Whom will you color start with? Download and start coloring right now and good luck! A hard day in the office? No fresh ideas? Take a break! A time of refreshment has come! Frootz is what you need! The logical sorting of eye-catching fruity shapes will help you take your breath! Collect all crystals from ancient lost tombs. Challenge your brain! Crystal Cave Goldcontains 20 levels sorted by the difficulty in an x-mass graphic scenario, with lots of logical riddles as well as action elements.